Since returning from my trip to Patagonia, I often find myself thinking about my journey. My week in Parque Patagonia was incredible — it was a unique experience to be totally isolated in one of Earth’s most beautiful places. As we hiked from alien rocky canyon floors to stunning mountaintop vistas, I frequently reminded myself to look up and process that we were the only people in hundreds of miles. It was the closest I have ever felt to nature, and I will be trying to recapture that feeling for many years to come. The group dynamics further cemented this as a trip of a lifetime. Chulengo did an amazing job of fostering an inclusive, energetic environment. We were honest with each other and ourselves in a way that rarely happens back home. Sitting around a fire doing Ask-Me-Anythings and telling stories with my companions was equally as memorable as the daytime hiking. I left this trip with friendships and connections that will last for years. I cannot recommend Chulengo enough. Despite the many hours and modes of transportation it takes to get to Patagonia, I already wish I could travel back for a repeat. Chulengo is a recipe for wonder. Our expedition with Nadine and Robin was equal parts athletic challenge, wilderness immersion, group camaraderie, and thrilling adventure. The landscape of Patagonia's Aysén Region makes for an endless course of obstacles and spectacular moments, provoking understandings on sense of self and conversations about the state of the Earth. I highly recommend Chulengo for both experienced backpackers and those of us who are still finding our footing outdoors. Chulengo offered us a transformative welcome to the future Patagonia National Park. Our group was quickly immersed into the fabric of the region, punctuated by glacial overhangs, countless waterfalls, and sunny afternoons among Andean condors. We explored more than I had anticipated: the simple pleasures of life on the trail (on the best routes!) while also traversing the complexities of the local history, conservation efforts, and broader sustainability topics. Logistical considerations were managed masterfully, and the Chulengo team did an excellent job mentoring people – offering trip packing guidance, skills-building (stream crossings; glissading), and subtle empowerment from the ridgelines to the grasslands. This made for a seamless introduction to this region among a diverse group. It was a tremendous opportunity to hit the trails with Nadine and Brooks! If you are interested in exploring the less explored and truly getting off the grid to re-wire your brain in the most positive of ways -- this is it. My Chulengo trip was a first class adventure. It was unique and memorable in so many ways. A few highlights: 1) Navigating the snow-covered passes and waist-high rivers that cover the landscape 2) Gaining a sense of Aysen history and the context behind the creation of Parque Patagonia 3) Listening to my trip mates discuss why national parks should be conserved, how they hope to shape the world, and what it's like to have a great-grandfather be struck by lightning. I came away from my trip with a notebook full of reflections, several albums worth of photographs, and countless great memories of my first backpacking trip in Patagonia." Recently, I was overcome by the desire to experience wild, remote places. With Patagonia at the top of my list, my best friend referred me to Chulengo Expeditions. My journey in the Aysén region began in Parque Patagonia, where Nadine, Brooks and I embarked on a warm-up day hike of the Avilés Trail. From the get-go, it was clear that Nadine has a thorough knowledge of the flora and fauna of the region – we tasted pan de indio straight from the trees and picked up puma poop to break apart & analyze. Next up was a 4-day, 3-night trek of Cerro Castillo. With this being my first multi-day, pack-bearing hike, coupled with a more than healthy fear of heights, there were more than a handful of moments of panic. Nadine and Brooks, both of whom are certified NOLS instructors, never lost a stride in their step; they taught me how to cross rivers, self-arrest & hike inclines / declines in snow and provided plenty of tips for hiking efficiently & effectively. With these tools, I quickly became more confident in my abilities as we progressed through the trek, and it was amazing to experience this growth alongside the Chulengo team. I left Cerro Castillo really taking to heart the following quote by Trevor Noah, “The highest rung of what’s possible is far beyond the world you can see.” I certainly bit off more than I could chew, but with a positive attitude and encouraging leaders, I accomplished far beyond what I could imagine. Throughout our trip in Cerro Castillo, Nadine, Brooks and I also engaged in meaningful conversations about conservation. Nadine was very thoughtful in guiding our journaling sessions – the first was sitting, eyes-closed, listening to our surrounding sounds and the second was thinking about our formative experience with wilderness. Both of these exercises culminated in a discussion about mindful conservation and how it is interwoven in our individual relationship with wilderness. Now that I'm back in the front-country, I am forever grateful to Chulengo Expeditions for a truly transformative experience, for teaching me invaluable outdoor skills and fostering conversations that inspire me to ground a respectful relationship with the rest of Earth. I've wanted to go to Patagonia since I learned it was a real place, on a real map. Though I've lived in the Rockies, little in my experience prepared me for the wildly varying landscapes and sheer magnitude of place that I encountered in the Aysen region in Northern Patagonia. Nadine and team guided us through more ecosystems than I could count. We swam every day, no two bodies of water alike. She offered details that helped us learn our surroundings, and quiet to study them. She showed us maps, and the topo lines the glaciers carved on valley walls. To experience a region on foot allows us to understand what makes it so valuable, and so vulnerable. Exploring a place through the lens of conservation makes us wonder what we can do to protect such regions abroad, and in our own communities. Chulengo Expeditions helps bring this exploration and its fruits to bear. We come home from our Chulengo trips full: of fresh air, fresh spirit, and fresh resolve to protect the wild and what it offers us. We can't help but bring a bit of Northern Patagonia home...that is, if we can bear to leave the paradise Valle Chacabuco at all! One evening really stands out - the first night we camped out on the edge of the lake after heading off trail. We cooked right on the rocky lakeshore and told stories around the campfire. I will forever remember Danny’s refrain: “I’m sooooooo sorrrryyy!” I’d felt nervous about embarking on a long trip in the middle of nowhere with a handful of strangers. I was so happy to share the journey with what turned out to be such a smart and witty crew. Later that same night I remember sitting by the edge of the lake in the dark, staring at the stars, which looked totally different because we were on the other side of the planet. I’d found a bleached bone lying on the rocks earlier, and put it between Jesse and myself as we talked - our very own momento mori, like the ones Brent mentioned Roman generals carried in their parades. I remember reflecting that I was probably at that moment as far away from my home, my normal life, from civilization entirely as I ever would be. Yet that distance didn’t feel alienating; it felt welcome because rather than focusing on the dust and scrub brush of the day to day, I could pull way back and see the graceful mountains and valleys of my own life. That level of perspective is rare and powerful. I reference my thinking from that trip an order of magnitude more than any I’ve done in the last couple years. The journey of self discovery is never over, but I trekked as far through my own head and my heart as we did in that backcountry. I think that’s the story I want to share more - that signing up for a trip with Chulengo isn’t just about seeing one of the last great unspoiled parts of the world, it’s also about the opportunity to spend time with an incredible group who will make you think, laugh, and teach you something. And if you’re really brave, I think it can also be a trip about charting the wild within yourself. I traveled to Patagonia with Chulengo in 2016, and it was one of the most transformative trips of my life. The beauty of Aysen is unspeakable; traversing the valleys of Parque Patagonia is an almost religious experience. But I can't imagine this experience without Chulengo. Beyond introducing us to this place — which I'm not sure we would have found otherwise — Chulengo immersed us in the ecological and conservation history of Patagonia. We left enriched not only by an epic outdoor experience, but also by a truly special educational experience as well. Do this. You can thank me later. I can't recommend Chulengo enough- our trip in February 2017 was truly unique. Memories of pristine lakes, glorious rainbows, wooded mountain passes, and awesome views don't tell the whole story. The people were the best. Adventurous nature lovers: friendships were made or renewed, trail talks were interesting (and lasted for days! ), campsite chats always inspiring. Oh, and Nadine's organization is flawless. With her guidance, even camping in the most remote wild corners of Parque Patagonia feels safe, familiar! We walked along the Chacabuco River, through a glacier-cut valley surrounded by steep mountains. We swam in frigid lakes, brilliant greens and blues. We saw herds of guanacos, grazing, and puma lairs, filled with guanaco bones. We camped under the brilliant and unfamiliar southern hemisphere stars. As we hiked, we learned about the park’s history and some of the debates surrounding its construction. After dinner each night, we gathered for conversation. We talked about wilderness, home, and conservation, weaving into our discussions our own relationships with nature and many environmental writings Nadine and Colleen shared with us. I’m grateful to have hiked with someone who knows the park intimately and who is working to open and share this beautiful place with as many as possible. 'Home' is an difficult thing to define - is it with your belongings? With your family? Where you grew up? I didn't expect to find it in the most inaccessible place I've ever been to: three flights, two van rides and a ferry away from the studio I pay my landlord to live in. But there it was: home, in a different campsite every night under a night sky so clear you could almost touch it, tucked into the valleys, alongside the fast flowing, clear running rivers of Patagonia. Nadine's easygoing, confident leadership is the reason this remote, vibrant wilderness felt so warm and welcoming. With such beauty at stake, I wouldn't choose to see Patagonia under the guidance of anyone but Chulengo. From the crystal-clear lake swimming and breath-taking landscapes, to the many chuckles around our dinner circles, this trip will remain with me as a reminder about how beautiful life can be. Nadine and Jay were able to turn the beauty of the Patagonian mountains into an intentional space for growth, learning and reflection. Such mastery is a rare find! I feel very privileged to have experienced nature in such finery with such wonderful people. Chulengo Expeditions' Nadine Lehner and Ben Wilcox created a fantastic experience for our school's educational trip to Patagonia. 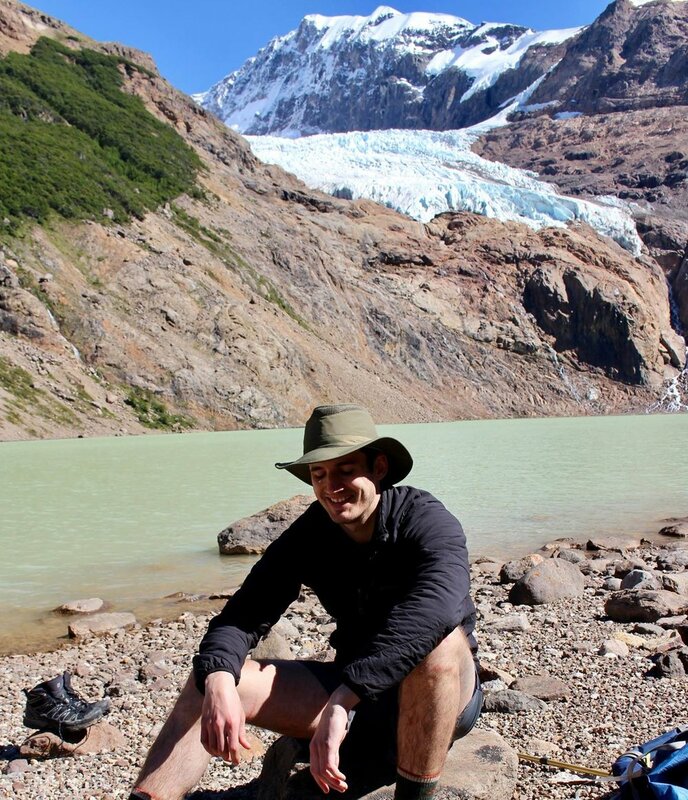 Not only did they safely lead our high-school group on two separate backpacking trips through Patagonia, they greatly augmented our understanding of the history, culture, ecology and significance of the place. 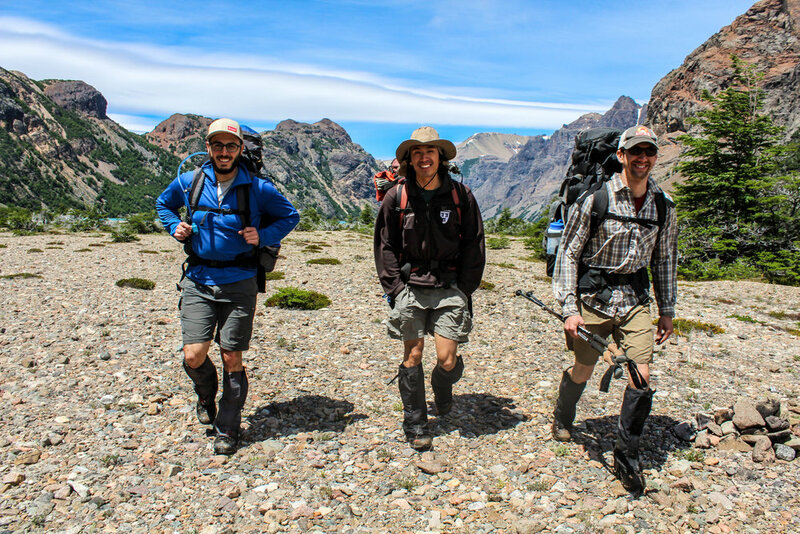 For Nadine, a NOLS instructor with a master’s degree in Environmental Science, classes included Leave No Trace travel, Patagonia predator-prey ecology, geology, and the creation of national parks. Ben, a Latin American History major who has spent several years in Brazil, Argentina, and Chile, taught us about patterns of the Chilean settlement and past Chilean land management practices, giving students a deeper sense of Chile’s current land policy. Furthermore, they were fun! Our juniors and seniors loved playing pick-up hacky-sack games, baking bread, and going on day-hikes with them. They are smart, impassioned people and wonderful role models for students embarking on college and beyond. From the start, I felt like Chulengo Expeditions was invested in our group: they both broadened our sense of place and insured that we had a magnificent time. Traveling with them is the difference between just seeing a place and experiencing it. Our 2017 Chulengo Expedition through Patagonia Park was absolutely fantastic! Nadine and Jay created an experience that was educational, inspirational and magical for me and my two children. Each day, while entirely immersed in nature, we enjoyed spectacular scenery on perfectly planned hiking routes and dined on healthy, delicious meals in the great outdoors. Nadine’s expertise as a naturalist was perfectly matched with her contagious passion for Patagonia and teaching the importance of conserving our natural world. Evening discussions were based on specifically chosen topics and fascinating for all of us. Nadine and Jay facilitated discussions while sharing leadership in a way that kept everyone engaged and enthusiastic as we bonded into a cohesive group and built strong friendships. The trip was truly an unforgettable adventure of a lifetime! We highly recommend Chulengo Expeditions for your family!